Creating new knowledge and reducing ignorance are two basic human needs. Science can help here, if we give it the freedom to do so and don’t chain it like Sisyphus to the rock of industrial production. Space missions are perhaps the prototype of humanity’s quest for knowledge, replacing more earth-bound adventures, expeditions and explorations, such as those undertaken by Alexander von Humboldt, for example, about which I wrote last summer. Like Humboldt, who published Kosmos to make science and nature public, space scientists in particular have been good at fostering public participation in science. To do this well images are needed. This brings me to the present day. At the beginning of July last year the spacecraft Juno entered orbit around Jupiter. As I sometimes write about space and space probes, I wrote a little post about this event. 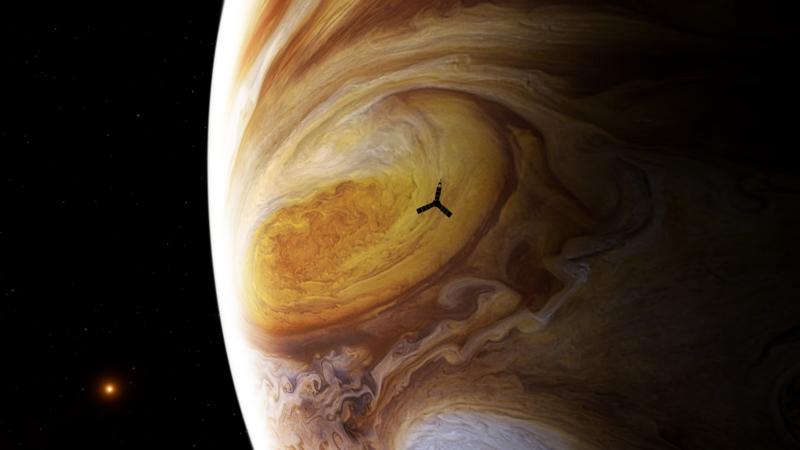 This year, on 10 July, Juno flew directly over Jupiter’s famous Red Spot and took pictures. Raw images are being made public (added to image libraries, processed by enthusiasts, discussed in the media) as I write. As NASA points out “This will be humanity’s first up-close and personal view of the gigantic feature — a storm monitored since 1830 and possibly existing for more than 350 years.” This mission will also help solve (if ever that is possible) some science mysteries that have been puzzling astronomers for centuries. To do this technology and engineering are of paramount importance. Again, space exploration offers perhaps some of the best examples of how science and engineering work together to solve problems and create new knowledge and understanding. The Red Spot on Jupiter is currently 10,000 miles wide (16,000 kilometres), but it’s shrinking “and scientists aren’t sure exactly why”. But there is more: “The massive, rust-red storm resides in Jupiter’s southern hemisphere, a cyclone of unknown crimson gases swirling around at hundreds of kilometers per hour”. So, there are quite a few intriguing unknowns highlighted here by Joe Hanson. But there is more. As another blogger, Phil Plait, points out: “It’s a little weird to think that we don’t really have much of a clue on what forces are shaping one of the single largest planetary features in the solar system.” In fact, the Red Spot is a “swirling mystery”, according to NASA. This is where Juno comes in. Here is a real-time simulation of the mission. Juno has already started to beam down some images of what the Red Spot looks like close-up, potentially increasing our understanding of its features, functions and future. As NASA points out, Juno is studying “Jupiter’s composition and interior structure, gathering data that will reveal clues about the planet’s formation and evolution. … Juno is scheduled to continue operating through at least February 2018.” So it’s not just a quick flyby. While waiting for the images to come in, I became intrigued by previous images of Jupiter’s Red Spot. It all began with Cassini, in more ways than one. Cassini the spacecraft prepared the way for Juno the spacecraft; and Giovanni Domenico Cassini the astronomer made first drawings of the Red Spot between 1665 and 1667. In 1831 the German amateur astronomer Samuel Heinrich Schwabe made a first detailed drawing of the spot, or rather of the contours of the spot. In 1857 he was awarded the Gold Medal of the Royal Astronomical Society and in 1868 he was elected a foreign member of the Royal Society. Perhaps Schwabe should also get a spacecraft named after him! Unfortunately, I couldn’t find any trace of this famous drawing. So if anybody can guide me to it, I would be most grateful. 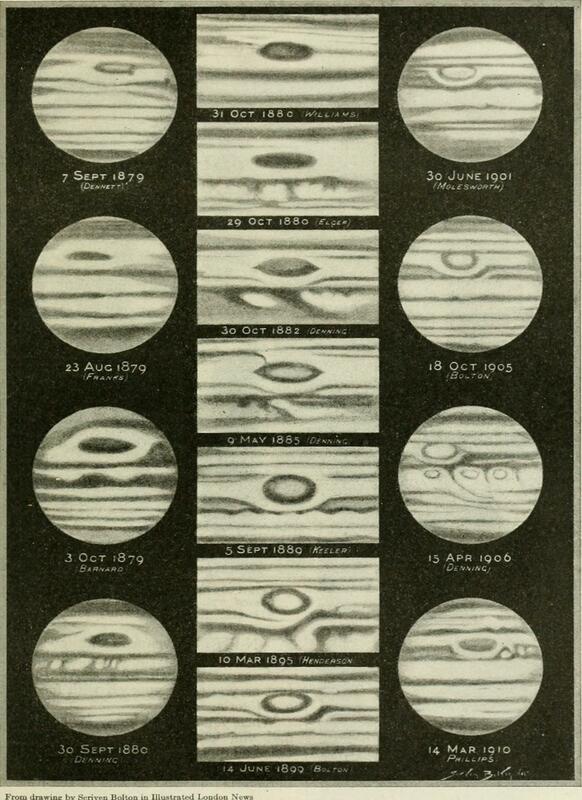 In 1872 Popular Science Monthly published images of the Red Spot of Jupiter (left). In 1879 a first blurry photo was taken of the Red Spot, which was reproduced in a book by Agnes Clerke’s entitled A Popular History of Astronomy in the 19th Century, published in 1885. In 1880 the French artist and astronomer Etienne Trouvelot created an engraving of the Red Spot (right). There must be many more famous paintings, drawings, etchings, engravings, photos etc. that I haven’t found. So if you have some knowledge of any of these, please let me know. 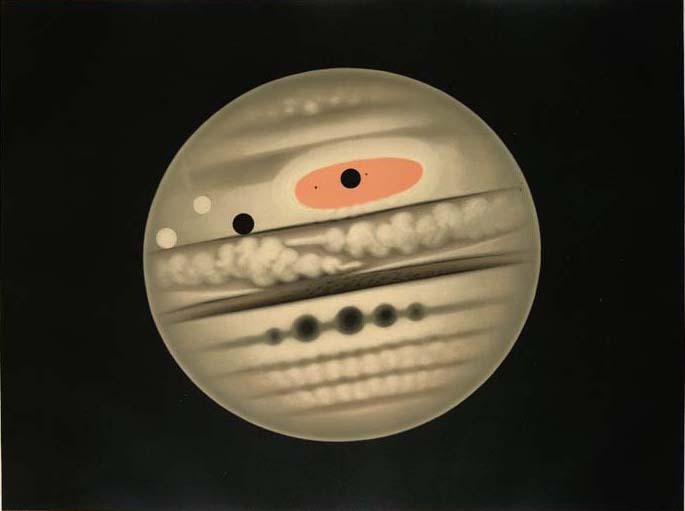 In modern times, the Hubble space telescope has supplied us with ample images of Jupiter and its spot, of which this one is the latest (I think). If you want a really dramatic one, have a look here. And here are some images that Juno made earlier. Looking at the Red Spot of Jupiter through telescopes, cameras, on the pages of popular magazines or on websites is at one at the same time looking at the history of science and the history of space exploration. Jupiter’s storm has been going for more than 300 years. So has science. And so have efforts to make science public and to include amateurs and citizens in the making of science, i.e. to make science and the creation of new knowledge not only a common good but a common enterprise. Juno’s images are a good way to foster participation, collaboration, education and enjoyment. I just read, “Space fans are already hard at work processing the images” and “Nasa releases raw data to public, enabling citizen scientists and experts to share their own processed versions of the images”….. May this continue ….